We don’t usually go for beige and orange — they’re just really not our colors — but something about this Anthropologie sweater strikes our fancy today. The details are what make this: the buttons are beautiful; according to the description they’re “dried blooms encased in crystal clear buttons.” (Close-up below. 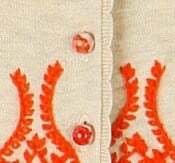 Looks like the orange embroidery is slightly raised, too, which we like.) The flutter sleeves are just right for work — not too girly but still detailed. The cotton is organic, too. We’d wear it with a dark brown pencil skirt, perhaps.